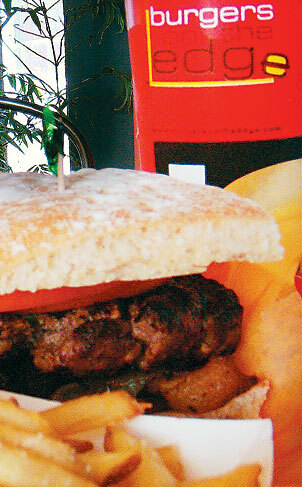 Foccaccia-like bread serve as buns for hardy patties at Burgers on the Edge. Out of Formaggio has emerged a fast-food phenomenon, Burgers on the Edge, the first of what I assume will be many having landed in front of the beautiful Safeway on Kapahulu Avenue. The main attractions are half-pound burgers of 100 percent ground chuck ($8.49) and wagyu beef ($12.49). The price seems steep until you consider the add-ons, which I consider to be better than the burgers. The ground chuck is particularly dry and flavorless, so spring for the wagyu if you can. With your burger, you are invited to choose one of 10 cheeses, one of 12 sauces, and four other toppings that range from the expected tomato slices and grilled onions, to thick slices of portabella mushrooms, apple wood-smoked bacon, mesclun, pineapple salsa, roasted red peppers and scorching jalapenos. One source of irritation to a lot of people is the foccaccia-like bread that serves as a bun. The burger patties are round, the bread is square and angular, and because it dries so quickly, you'll find the points jabbing your mouth even as it crumbles around the burger. If you can't eat red meat, there are portabella ($7.49), ground turkey ($8.49) and chicken breast ($7.99) options. If you feel guilty about all that meat, you can also order a very basic Caesar salad ($8.99). Next to the toppings, what I like most here are the french fries ($2.89), with the deep, earthy flavor of truffle oil and sprinkling of Parmesan. Restaurateur Wes Zane has come full circle since his days with the health-conscious Mr. Goodburger, no doubt having found people pay a lot of lip service to healthy cuisine, but what the majority really wants is an all-beef burger with all the trimmings. The dizzying viewing schedule of the 2008 Summer Olympics from Beijing, as telecast by the NBC family of networks, begins in earnest Friday evening with primetime coverage of the opening ceremonies from 6 to 10:30 p.m. on KHNL NBC8. With the bulk of Hawaii viewers using Oceanic Time Warner Cable's basic or digital service, the games will also be seen during the Olympics' 2 1/2 weeks on MSNBC, CNBC, the USA Network, Oxygen and Universal HD. The Brothers Cazimero continue their interisland promotion tour for their new album "Destiny" with an appearance at the Hawaii Kai Towne Center. The free concert starts at 5:30 p.m. Saturday at the Waterfront stage. Both Robert and Roland will be available for autographs and CD sales after their concert, plus there will be drawings for free door prizes held throughout the evening. No outside coolers, alcoholic beverages, or pets will be allowed. Call 396-0766. This weekend's Sunset on the Beach in Waikiki has a nautical theme. On the big screen just after sunset: Saturday, two video shorts - "Guardians of the Sea" and "Access Surf" - and an episode of "Eco Adventures." The popular animated feature "Surf's Up" screens Sunday. "Eco Adventures" will feature segments on a lava tube hike on the Big Island, bodyboarding the crushing shorebreak at world-famous Waimea Bay, canoe paddling with members of the group Manoa DNA (who are also scheduled to entertain that evening), surfing at the annual Duke's Oceanfest at Waikiki Beach, a shark tour off of Oahu, kiteboarding at Maui's Kite Beach and kayaking at picturesque Lanikai. Simplisity will provide music on Sunday, with both nights' activities starting at 5:30. Food booths will be manned by the good folk at Royal Hawaiian Hot Dog, M & N's Treats, K's Restaurant, Papa John's Hawaii, Bale and Le Crepe Cafe. Call the Waikiki Improvement Association at 923-1094. Due to a scheduling conflict with the Honolulu Academy of Arts' annual food-and-wine fundraiser, the free Bank of Hawaii Family Sunday will be a week earlier this month. So from 11 a.m. to 5 p.m. Sunday, families can explore the theme of "ultraVIOLET," with the day's activities and scavenger hunt centering on the color purple. Add to the ongoing wall mural with violet crayons and pens, make violet balloon sculptures and tissue paper flowers, learn about ultraviolet rays and even "taste" purple by sampling Okinawan sweet potato, acai blue sorbet and purple Asian slaw.